""Red Summer" is about life at the extreme edge of the food chain, and nowhere is the food chain more violent, more awesome or more intense than in Egegik... 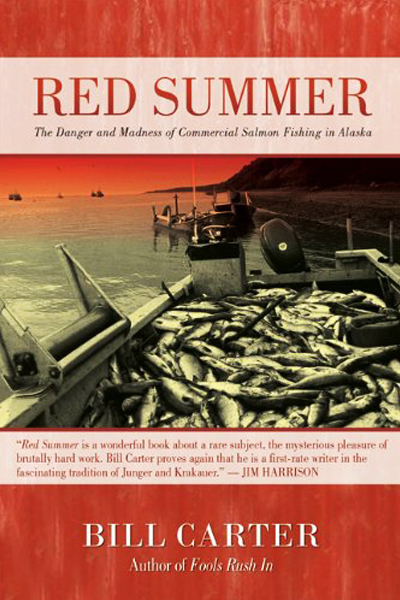 This is the ugly side of commercial fishing that you don't see on the adrenaline-soaked Discovery "
""Red Summer" is actually the story of four summers, and although his descriptions of the brutality of the work and life are unflinching, he deftly illuminates their perverse appeal." "Red Summer is a wonderful book about a rare subject, the mysterious pleasure of brutally hard work. Bill Carter proves again that he is a first-rate writer in fascinating tradition of Junger and Krakauer." "Go fall off the edge of the earth and you might just get to a place where life still throbs. Bill Carter fell and felt the blasts of the Bering Sea blow away our pious lies about ourselves and the thing we call nature. This vivid and engaging book sketche"